Looking for a cute cake pop recipe? You've got to try our Snowball Cake Pops! Yellow cake pops are dipped in melted white chocolate and then sprinkled with flaked coconut. Prepare cake batter and bake as directed on package for 13x9-inch cake, blending dry pudding mix into batter before pouring into prepared pan. Cool cake in pan 15 min. Remove to wire rack; cool completely. Cut cake into large pieces. Use pulsing action of food processor to process cake, in batches, to form fine crumbs; place in large bowl. Add small amount of frosting; mix with hands until blended. Add remaining frosting; mix well. Roll into 50 (1-inch) balls. Cover baking sheets with parchment. Melt chocolate as directed on package. Dip 1 end of lollipop stick into melted chocolate, then insert halfway into cake ball. Repeat with additional lollipop sticks and remaining cake balls. Dip, 1 at a time, into remaining chocolate, covering 2/3 of cake ball with chocolate. Gently shake off excess chocolate. 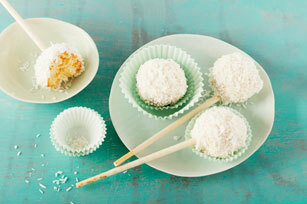 Dip cake balls, 1 at a time, in coconut, turning to completely coat chocolate with coconut. Let stand until chocolate coating is firm. Use your hands to crumble the cake instead of using the food processor. For best results, cut hard edges off the cake before crumbling remaining cake. Prepare using a chocolate cake mix, Jell-O Chocolate Instant Pudding and 1-1/2 pkg. (225 g each) Baker's Semi-Sweet Chocolate (12 oz. ).